Now you can master the latest version of the fundamental SQL language used in all relational databases today with ORACLE 12C: SQL, 3E. Much more than a study guide, this edition helps you transform a basic knowledge of databases into proficiency with the latest SQL and Oracle concepts and techniques. You learn to use Oracle 12c SQL most effectively as you prepare for the first exam in the Oracle Database Administrator or Oracle Developer Certification Exam paths. This edition initially focuses on creating database objects, including tables, constraints, indexes, sequences, manipulating data, and more. The author then explores both basic data query techniques as well as advanced query topics using a proven hands-on approach. ORACLE 12C: SQL, 3E introduces the latest features and enhancements in 12c, from enhanced data types and invisible columns to new CROSS and OUTER APPLY methods for joins. To help you transition to further studies and even more advanced books in this series, appendixes introduce SQL tuning, compare Oracle's SQL syntax with other databases, and overview Oracle connection interface tools: SQL Developer and SQL Plus. 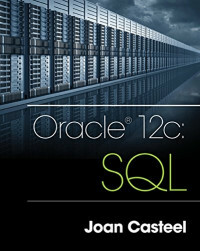 Trust ORACLE 12C: SQL, 3E to provide the knowledge you need for Oracle certification testing and the solid foundation for pursuing a career as a database administrator or developer.